Most of the previous studies regarding the effects of gel-forming fibres have considered the gastric emptying of liquid or solid meals after the addition of pectin or guar gum. The influence of locust bean gum, on gastric emptying of nutrient semisolid meals in humans has been less well studied, despite its common occurrence in foods. Using a standardised ultrasound method, this study was aimed at investigating if the gastric emptying in healthy subjects could be influenced by adding locust been gum, a widely used thickening agent, or water directly into a nutrient semisolid test meal. The viscosity of a basic test meal (300 g rice pudding, 330 kcal) was increased by adding Nestargel (6 g, 2.4 kcal), containing viscous dietary fibres (96.5%) provided as seed flour of locust bean gum, and decreased by adding 100 ml of water. Gastric emptying of these three test meals were evaluated in fifteen healthy non-smoking volunteers, using ultrasound measurements of the gastric antral area to estimate the gastric emptying rate (GER). The median value of GER with the basic test meal (rice pudding) was estimated at 63 %, (range 47 to 84 %), (the first quartile = 61 %, the third quartile = 69 %). Increasing the viscosity of the rice pudding by adding Nestargel, resulted in significantly lower gastric emptying rates (p < 0.01), median GER 54 %, (range 7 to 71 %), (the first quartile = 48 %, the third quartile = 60 %). 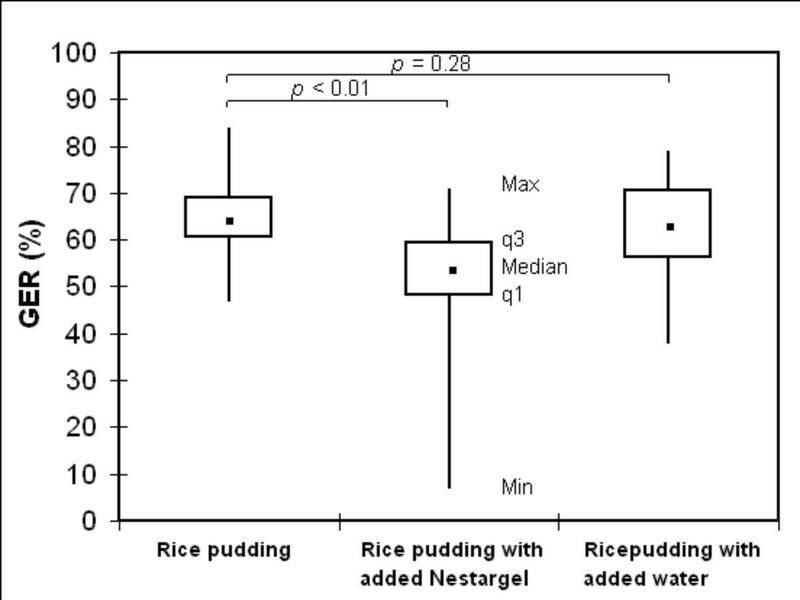 When the viscosity of the rice pudding was decreased (basic test meal added with water), the difference in median GER 65 %, (range 38 to 79 %), (the first quartile = 56 %, the third quartile = 71 %) was not significantly different (p = 0.28) compared to the GER of the basic test meal. We conclude that the addition of locust bean gum to a nutrient semisolid meal has a major impact on gastric emptying by delaying the emptying rate, but that the addition of water to this test meal has no influence on gastric emptying in healthy subjects. Many factors are believed to affect gastric emptying, including the volume and energy density of the meal and its viscosity and particle size . The blood glucose level, hyperinsulinemia, gender, certain drugs , body size , meal temperature , and smoking  could be other influencing factors. Dietary fibers has a number of metabolic effects, some of which are potentially useful in treating pathological conditions such as obesity, hypercholesterolaemia, and diabetes mellitus [6, 7]. They include a range of relatively poorly digested food substances mainly composed of non-starch polysaccharides. Generally dietary fibers sources can be grouped into two major types due to their quite different physiological effects: soluble (viscous and fermentable), and insoluble (non-viscous, slowly fermentable). Viscous gel-forming fiber's includes pectins and gums and these natural colloids are multi-branched hydrophilic substances having the capability of absorbing water readily and forming viscous solutions. Several studies indicate that the addition of viscous soluble fiber's to the meal [8–12] as well as fibre naturally present in food  reduce the gastric emptying rate and the glycemic response to a test meal. A delayed absorption due to increased viscosity of the intestinal content has been suggested to partly explain the reduced glycemic response in other studies [14, 15]. Despite the capability of the water soluble dietary fibres to form viscous solutions, it is not known if the reduction in gastric emptying is due to increased meal viscosity or effects on antroduodenal coordination by alteration in duodenal feedback from mucosal receptors. Most of the previous studies regarding the effects of gel-forming fibres have considered the gastric emptying of liquid or solid meals after the addition of pectin or guar gum. The influence of locust bean gum, on gastric emptying of nutrient semisolid meals in humans has been less well studied, despite its common occurrence in foods. Torsdottir  have shown that an addition of 300 ml of water as a drink with the meal increased the glycemic response in healthy subjects and well-controlled non-insulin-dependent diabetic patients, thus suggesting that this effect might be mediated by an altered gastric emptying. Still, no measurements on gastric emptying were done to prove it. Contradictory results indicate that following ingestion of a solid-liquid meal, the stomach retains solid food predominantly in the proximal stomach, until the majority (about 80 %) of the liquid has emptied [17–19]. The gastric response to water added directly into a semisolid meal is less well studied and might involve different mechanisms for gastric emptying than emptying of mixed solids-liquid meals. Using a standardised ultrasound method, this study was aimed at investigating if the gastric emptying in healthy subjects could be influenced by adding locust been gum to a nutrient semisolid test meal. The effect on gastric emptying by adding water directly into this semisolid test meal was also evaluated. Gastric emptying rates of three test meals with different viscosity were evaluated. The temperature of 15 randomly selected test meals was measured immediately prior to ingestion (mean temperature, 21.2 ± 1.9°C). The basic test meal consisted of 300 g rice pudding (330 kcal, provided as 10% protein, 58% carbohydrate and 32% fat), (Scan Risgrynsgröt, Scan Foods, Johanneshov, Sweden). To increase the viscosity of this semisolid basic test meal 6 g Nestargel (2.4 kcal) was stirred into the basic test meal (rice pudding) homogeneously 2 hours before being served. The increase in viscosity was considerable and visible for the eye. Nestargel (Swedish Nestlé AB, Findus®, Bjuv, Sweden), usually used as a milk thickener for infants because of its water-binding capacity, is a low calorie product containing soluble, viscous dietary fibres (96.5%) provided as seed flour of locust bean gum (St. John's bread), and calciumlactate (3.5%). It does not contain gluten and is able to keep its capability to increase the viscosity of the test meal used in this study (rice pudding) despite changes in meal temperatures up to 50°C. By adding 100 ml of water into the basic test meal, stirred homogeneously 2 hours before being served, a considerable decrease in the viscosity of the test meal was achieved. Fifteen healthy non-smoking volunteers, all from the southern county of Sweden, 6 men and 9 women, aged 18 – 68 years (mean age 35 ± 17 years), with normal body mass indices (mean BMI 23.1 ± 3.0 kg/m2; range 18.1 – 26.8 kg/m2) and without symptoms of gastrointestinal disease, participated in the study. None of the subjects had a prior history of gastrointestinal surgery (except for appendectomy), were on any medication (including birth control medication) or did use snuff. On each study day any current symptoms attributable to the gastrointestinal tract were noted, and the fasting blood glucose checked for normal concentrations using finger-prick capillary blood samples. Subjects reporting temporary abnormal defecation such as constipation or diarrhea  were examined on another occasion when these conditions were normalized. At three separate mornings, the subjects were served the test meals in a random order as a breakfast, after an overnight fast (8 hours). The test meals were ingested within five minutes and the ultrasound examinations were done in the same room between 8:00 and 10:00 AM. All subjects obtained written information prior to the study and were aware of the possibility of withdrawing from the study at any time they desired. For each subject and type of test meal the gastric emptying rate (GER) was calculated, and the values presented as median values with range and quartiles (q1 – q3). These data were evaluated using the Wilcoxon signed rank test and statistical analysis were carried out for the GER, using a two-sided test. Values of p < 0.05 were considered significant. The median changes of the GER (Δmedian) for the rice pudding after increasing (Δmediani) / decreasing (Δmediand) the viscosity were calculated and expressed with ranges. All statistical calculations were performed in SigmaStat 2.0 for Windows®. The median value of GER with the basic test meal (rice pudding) was estimated at 63 %, (range 47 to 84 %), (q1 = 61 %, q3 = 69 %). 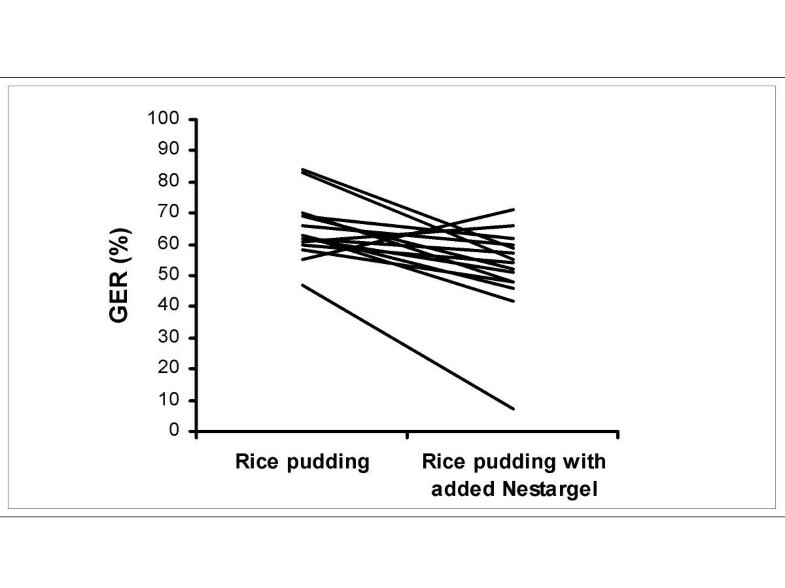 Increasing the viscosity of the rice pudding by adding Nestargel, resulted in significantly lower gastric emptying rates (p < 0.01), median GER 54 %, (range 7 to 71 %), (q1 = 48 %, q3 = 60 %), (Figure 1). Individual GER values showed a decreased gastric emptying in all but two subjects and a median decrease in GER with 11 % (Δmediani = -11%), (range -40 to 16 %), after the addition of Nestargel to the rice pudding (Figure 2). Gastric emptying of rice pudding, rice pudding with added Nestargel and rice pudding with added water, estimated as gastric emptying rate (GER), in healthy subjects. The median, minimum (Min), and maximum (Max) values and the values of the first (q1) and third (q3) quartiles are shown. Values of p < 0.05 were considered significant. Individual values of gastric emptying of rice pudding and rice pudding with added Nestargel, estimated as gastric emptying rate (GER), in healthy subjects. 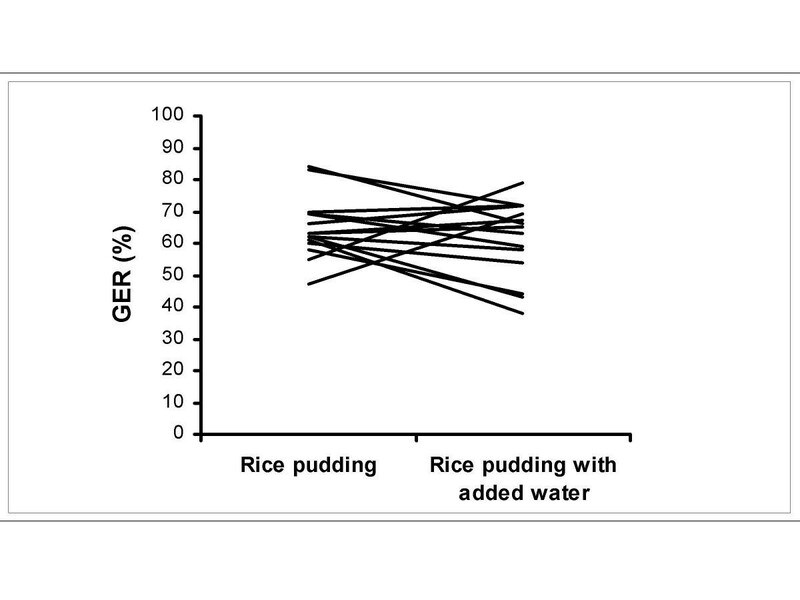 A wide spread in the GER were noted when the viscosity of the rice pudding was decreased (basic test meal added with water), showing higher gastric emptying rates in 6 subjects, still lower rates in 9 subjects (Figure 3). The median change in GER indicated a decrease in GER with 6 % (Δmediand = -6 %), (range -23 to 24 %), but the difference in GER 65 %, (range 38 to 79 %), (q1 = 56 %, q3 = 71 %) was nonsignificant (p = 0.28) compared to the GER of the basic test meal (Figure 1). Individual values of gastric emptying of rice pudding and rice pudding with added water, estimated as gastric emptying rate (GER), in healthy subjects. This study demonstrates that the addition of locust bean gum but not water significantly influences the gastric emptying rate of a nutrient semisolid meal in healthy subjects. Despite the addition of only 6 g Nestargel to the rice pudding (basic test meal), which is less than 2 % of the total test meal weight, the individual GER values showed a decreased gastric emptying in all but two subjects and a median decrease in GER with 11 % (Figure 2). The effect of locust bean gum agrees with previous results of other viscous fibers, such as pectin and guar gum. Actually, almost all previous studies regarding the effects of gel-forming fibers have considered the gastric emptying of liquid or solid meals after the addition of pectin or guar gum. The influence of locust bean gum on gastric emptying of a nutrient semisolid meal in humans has been less well studied previously, despite its common occurrence in foods. Locust bean gum (St. John's bread, carob seed gum), the gum extract from carob seed (Ceratonia siliqua), is widely used as a thickening and stabilizing agent in food (e.g. ice cream, yogurt, mayonnaise, ketchup, marmalades, soups, desserts, sauces, bakery products, processed cheese and other) as well as a pharmaceutics agent (e.g. gastro-oesophageal reflux in infants and children). Since locust bean gum is not digested or absorbed in the stomach or the small bowel and the caloric content in the 6 g Nestargel (2.4 kcal) added to the basic test meal was minimal, a caloric influence of Nestargel on gastric emptying was interpreted as insignificant in this study. The preparing time and the meal temperature might influence the viscosity of the water soluble fibers in the meal. The preparing procedure was therefore identical each time (the fibers stirred into the rice pudding, without heating, 2 hours before ingestion). Furthermore, the gastric motility might be influenced by meal temperature , but as the mean temperature of the test meals used in this study, measured immediately prior to ingestion, showed only very slight variation (mean temperature, 21.2 ± 1.9°C) such a possible influence was interpreted as insignificant. Locust bean gum has been shown to manage  or fail  in decreasing the postprandial glucose response in non-insulin-dependent diabetes patients. Previously, it has been shown that the effect of fiber-enriched wheat bran (Fiberform), added to a semisolid meal consisting of wheatmeal porridge and juice, caused an accumulation of the meal within the proximal stomach . Assuming a similar effect of locust bean gum, this might delay the time for the postprandial antral area to reach its maximum value, giving a lower 15 min postprandial antral area and a wider 90 min postprandial antral area, depending on the time necessary for the proximal part of the stomach (the fundus) to deliver the food to the lower part of the stomach (the antrum), consequently reducing the value of the GER. A study on healthy volunteers, using magnetic resonance imaging, showed that the gastric response to increased viscosity of a non-nutrient locust bean gum water solution was rapid intragastric dilution, causing a reduction of the initial large difference in viscosity . This rapid dilution minimized the differences in the gastric emptying rates resulting in a minimal delay of gastric emptying. Despite that viscosity varied 1000-fold between the solutions used in that study, emptying rates differed by a factor of only 1.3. This dilution response was suggested to be either due to salivation or acid secretion. However, the subjects were intubated with a nasogastric tube during the trial and intubation could influence gastric motility . In the present study no intubation technique was used and the meal served, a nutrient semisolid test meal, was more representative of an ordinary breakfast meal, at least in Sweden. This is an important fact since the increased outflow resistance due to pylorospasm and altered antroduodenal motility probably is much more important in nutrient than non-nutrient meals [29, 30]. It has been suggested that acid secretion is lower in diabetic patient, probably due to vagal neuropathy [31, 32]. Such possible differences in gastric juice secretion between diabetic patients, with vagal neuropathy and gastroparesis, and healthy subjects might limit the capability of the stomach to reduce the viscosity of the gastric content resulting in a greater impact of meal viscosity on gastric emptying. Previously it has been claimed that when fiber arrives in the distal ileum or in the colon, it exerts a negative feedback on gastric emptying (the 'ileal brake') [33, 34]. Similarly, one could expect that the influence of locust bean gum on gastric emptying would be due to duodenal feedback controlling antroduodenal coordination and inhibiting gastric emptying , since rapid intragastric dilution decreases meal viscosity. This might be due to delayed absorption of nutrients (e.g. fats) in the duodenum induced by the presence of fibers in the meal . In our study, the addition of 100 ml water to a nutrient semisolid meal did not influence gastric emptying in healthy subjects. The total caloric content of the basic test meal with added water was the same as the one without water (330 kcal), still the results are surprising. Actually, since the volume and nutrient density of a meal are considered to be important factors for the GER  we expected the gastric emptying to be increased after the addition of water to the rice pudding, due to increased volume, and decreased caloric density and viscosity. On the other hand, the water volume added to the test meal might have been to small to provoke a change in gastric emptying rate, despite the considerable decrease in viscosity visible for the eye. Also, in the present study the GER vary widely and more for the test meal with added water than the other test meals (Figure 3). We could not explain this difference. Solid foods empties separately, and more slowly, from the stomach than liquids [17–19], while semisolid foods probably empties in a way more like nutrient liquids. Compared to the study by Thorsdottir , our study considered the effect on gastric emptying by adding water into a semisolid meal instead of drinking the water together with a solid meal. We conclude that the addition of locust bean gum to a nutrient semisolid meal has a major impact on gastric emptying by delaying the emptying rate, but that the addition of water to this test meal has no influence on gastric emptying in healthy subjects. Whether similar results occur in patients with gastroparesis and functional dyspepsia remains to be seen since the effects might be different when the gastric motor function is disordered. The authors thank Jan-Åke Nilsson for valuable advice on the statistical analysis of our data.